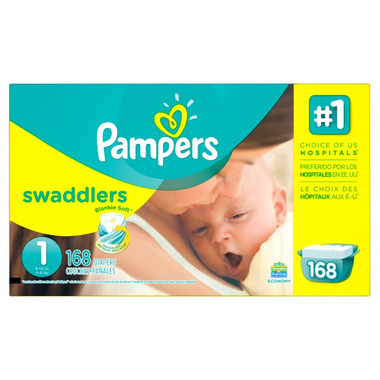 Wrap your baby in Pampers Swaddlers diapers, their most trusted comfort and protection and the #1 Choice of Hospitals.This Blankie Soft diaper with a unique Absorb Away Liner pulls wetness and mess away from baby's skin to help keep your baby comfortable. It also has a color-changing wetness indicator that tells you when your baby might need a change. Finally, make sure your baby's delicate belly is protected with the contoured umbilical notch. Really well-priced. Swaddlers fit my son well, no leaks. Love the band to tell me if the diaper has been owed in that turns from yellow to blue and the Sesame Street characters in them. My son wore Pampers from the time he was in the NICU after he was born. We have tried other brands but keep coming back to Pampers as it is more easily available in my area. I just wish they didn't have that fake fragrance - my baby smells great on his own. After trying 5 other brands including all the Eco/organic options as our daughter kept getting rashes, these were a life saver and a bum saver! These are also the only ones I've found that trap in her poo explorations! Love this shopping experience online. Free fast shipping, well packaged, perfect product. Fit well and know when to change diapers! This brand of diapers has a superior design to contain blowouts while providing my child with superior comfort. Much better product than huggies! The best fit and most absorbent diapers out there. Also super soft! Love that Pampers listened to their customers and released a size 5. Ordered these when they were on sale and the price beat out all the large stores in town. Yay Well.ca! Awesome diapers! Made even better by the fact that they get delivered right to my door! Best diapers ever...has never leaked on me with 2 kids! So happy they are in size 5! I missed these when my son grew bigger than size 2. Now I am potty training him and I can easily check the "pee line" to see if it is green or not. Best diapers on the market... By far! Best of all the diapers I've tried! Glad they're making bigger sizes now. Ha ! The joys of getting your diapers delivered to your door ! I could'nt buy them any other way. Top Product, excellent service, fast delivery and great prices! Got this on sale too! Excellent diapers! So glad they increase the sizes for Swaddlers :) love these from birth right on up.